The Johann Strauss Society of Great Britain has sponsored a number of recordings by Chandos Records of music by the Strauss family and their musical contemporaries. These are designed to provide an opportunity for some of the lesser-known works to be heard. Vienna Première volumes I, II and III feature are conducted by Jack Rothstein. Volumes I and II feature the Johann Strauss Orchestra of London and soprano Marilyn Hill Smith. Volume III features the Viennese Orchestra of London. 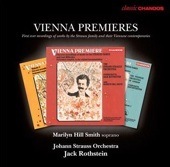 Chandos re-released these CDs in 2011 in a box set, entitled Vienna Premiere (Orchestral Works).